So this title might lead one to believe my pre-release was “bad”. It wasn’t bad, but it also was not too great either. Essentially our 2HG bid ended so badly we decided to play in the main event an hour later on impulse. I’m beyond exhausted and playing Magic pretty much since noon so this post is going to be brief. 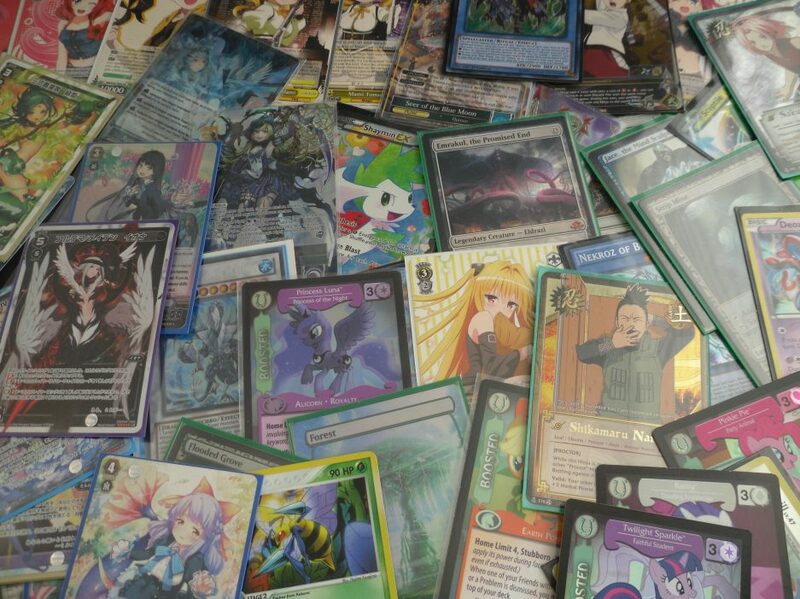 This weird messy photo is the end result of our two decks. Not only did we start the day off with a savage round 1 teamkill, but things were put over the top when our friend busted out the dreaded turn 4 Chandra, Torch of Defiance. We tried to kill it with Hunt the Weak to kill their Aerial Responder with our own, but a Subtle Strike ended that and Chandra killed us in short order afterward. We played against the same couple that I’ve encountered at least 5 times now in this city. We played a pretty fair back and forth until the guy played Saheeli’s Artistry to copy our Cultivator of Blades and his partner’s Ovalchase Dragster. They then swung for 12, pumped to 15 by a Built to Smash. Things like that are hard to recover from and from the already dismal tone of this post you can tell that we didn’t. I played Black/White Midrange with the bombs of the Skysovereign, Consul Flagship and the Angel of Invention. My opponent kept a slow hand game 1 and I took the early lead. He tried to stabilize with Multiform Wonder, but it lost to my creature swarm. Game 2 I again steamroll him, this time due to color issues. Game 1 my opponent gets color-screwed and loses. Game 2 I mulligan to 5, struggle quite a bit then lose. and finally Game 3 my opponent’s first 6 lands were 5 plains and 1 Aether Hub. It was a miracle he managed to cast any spells at all. Game 1 he got his Flagship established and I lost. Game 2 I saw my flagship die, but it got me enough value to still win. Game 3 I lose in time after misplaying and not killing his Marionette Master before he managed to kill one of his own artifacts to burn me for game. I agree with my opponent to split, but he asks that we play the match out for the extra pack. I acquiesce before stealing game 1 off my Flagship. Game 2 I just removed his threats until I had board control. My opponent post game that he had a Chandra that never arrived. So I won 4 packs which I cracked, opening a Torrential Gearhulk that has since been traded away. It wasn’t a bad day. My roommate opened a Painter’s Servant masterpiece, friends from round one opened Chandra and Sculpting Steel masterpiece. Meanwhile, I can always look back at my Expedition Flooded Grove and recall that my luck had been sent long ago. Still I had a good time overall. Though going to events back to back is very bad for at least my own sanity. I’m really tired, but I might as well recant the tales of now yesterday’s yugioh regional. I’m just going to recall what I can from remember in as few words as possible. Please pardon any spelling/grammar goofs. I played Nekroz Kaiju. I’m going to just say upfront I had no thoughts of winning or topping this regional. I just wanted to spend time with friends, trade and hopefully plus. I did manage to do this thankfully. Guy didn’t the Super Quantum Boss monster, which helps because I never saw a Kaiju. Interrupted Kaiju Slumber did come down and swung the game in my favor. We then started a game of cat&mouse as I tried to Synchro Trish him and he desperately tried to stop it, first with Artifact Scythe, then by using the Red Super Quant to pop Glow-Up Bulb. He didn’t. Game 2 He makes the Red Xyz guy and Dweller, but I had the Kaiju that led to his defeat. So I had to figure out how the trap that summons Buster Blader and miracle fusions Buster Blader worked on the fly. Then how the lock worked. That being said once I realized that Kaijus easily answered his entire set-up the match-up was easy. Game 2 similarly was won by Kaiju over Buster Dragon turning the Buster Blader fusion into a 3000 vanilla piercer. Opponent passes without doing anything and hit him for a bunch. He then scooped. Game 2 he starts combo-ing with the Fire King Island, but I manage some opposition. He ends his turn by summoning 2 Cyber Dragon Infinities on my open board. I had a set instant fusion and no cards in hand (also I later learned that making 2 CDIs in the same turn using Nova Dragon was illegal, but yeah). I topdecked Senju, played it, it got negated. Used a mirror to search from grave, he negated. Then I flipped Instant Fusion made #39 The Lightning and swung for game. This was the highlight was whole day. I was quickly paid back by a much better Kozmo player. Majespecter Kirin single-handedly beat me 2 games in a row. I had never seen this deck before (despite knowing it had topped). I was also falling asleep at the table so that contributed to my losing yet again. My opponent couldn’t out Dogoran, but I scooped to have time for games 2 and 3. I didn’t get that far due to bricking. Ok, after a long 5 rounds of consecutive losses, this game was my last stand. My opponent had mashed 2 structure decks together and added literally every meta relevant. While Arkbrave Dragon + Dragunity Leviathan was his key combo, he also had Crystal Wing, Omega, Anti-Spell and Strike. I still took game 1 after I trished his Arkbrave. Game 2 I took the Maxx C, got him to 1600 life, but misplayed not negating his dragon ravine with #38. He made Crystal Wing + Coral Dragon and raigeki’d me, but I chained Treacherous Trap Hole to destroy everything. I topdecked instant fusion, but lost to antispell making me set it first. Game 3 he tries the same combo with Red Eyes Darkness Metal, but Kaiju Slumber into Kaleidoscope gave me the end board of #38 and Abyss Dweller which finished him off in my only game 3 of the day. Well I’m not getting sucked back into competitive Yugioh (at least not whole Pot of Desires is $70). But after abandoning Fow (other than its EDH format, which is great and deserves its own post another day), I have focused much more on my Magic EDH decks. That being said I still and will always love Nekroz and yugioh. This tournament was just a break from the monotony of college life. Also I picked up these cards in various trades, purchases and also moved my Omega at long last. Today was a wild ride. I don’t regret it. I had a fun overall, hanging out with great friends (2 of which topped the regional!). Thanks for managing to interpret this rambling.